The original “F— The Police”. THE SCENE: In 1977 the government of Nigeria was thick with corrupt brutish thugs, the type who denied civil rights to its populace as a matter of principle. 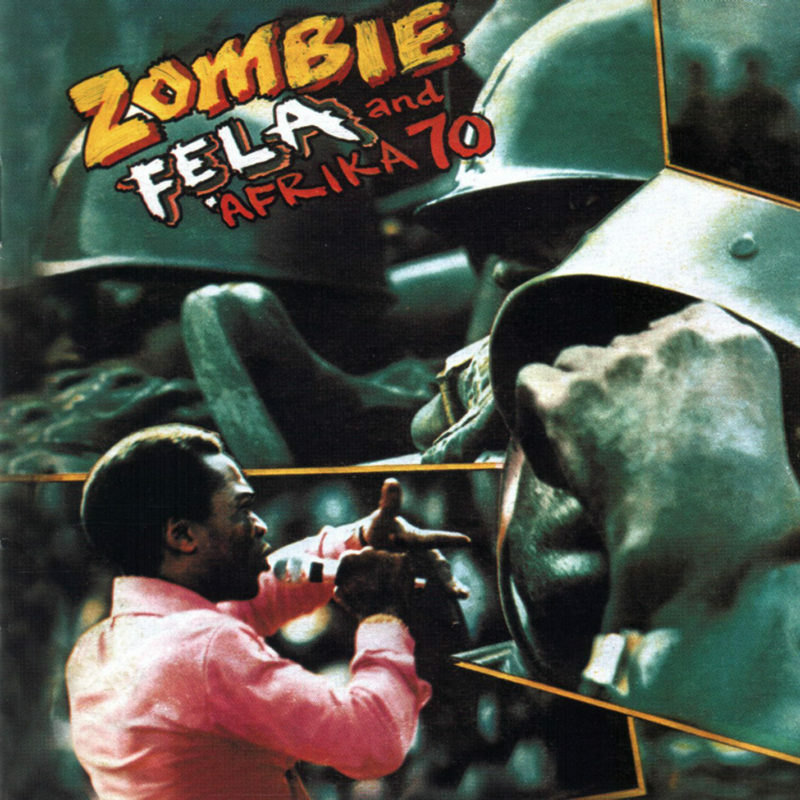 Of the many activists who spoke out against the regime none was more popular than bandleader Fela Kuti, who released numerous top-selling albums criticizing the governments’ wide-ranging incompetence, peaking with the incendiary Zombie. Over a twelve-minute percolation of tart guitar skanks, brisk funk beats and hard horns bleats, his band Afrika 70 tightly rages through the title track, in a sound Fela dubbed “Afrobeat”. Muscular as a bicep yet deft as a finger, the song pulses large and small, hot and cold, sometimes reducing down to a mere guitar pluck and a shaker that sounds like sizzling rice soup. At twelve minutes long and the entirety of Side One, ”Zombie” is a energetic full-body release of frustration, from the legs to the brain, simultaneously an exhortation and an exorcism. In retaliation he delivered his mother’s coffin to the main army barracks in Lagos, then wrote about the experience in the title song of his subsequent album Coffin for Head of State. Even in mourning, Fela was uncompromising about the nature of right and wrong. American musicians, even with their freedom of speech under attack, have it pretty easy, “Cop Killer” got Ice-T dropped from his label, but 15 years later he’s made millions playing a cop on a television. The 15 years following Zombie found Fela surviving additional police beatings, plus a two-year jail sentence on trumped-up currency fraud charges. He consistently put his livelihood and his life on the line with each album, and Zombie was his fearless masterpiece. NEXT WEEK: Rufus Harley and his electric…bagpipes?